I was speaking at a conference recently in Washington DC. After my keynote address, while signing books for attendees, I asked one of the attendees her secret to growing their business. She replied “We just make sure that we are at least 5% below our competition.” Her response made me want to cry. OK – that’s a bit of an exaggeration. When you sell on price, you teach your client or prospect that all that matters is price. Let’s say you convince your prospect that they should switch from their existing vendor to you because you can offer them a lower price. Congratulations. However, did it ever occur to you that they’ll leave you for another vendor for the same reason? You are teaching your market that your differentiator is price. There are plenty of very successful businesses that compete based on price. There are contractors who lowball their initial bids, and are the masters of change orders. Simply put, most people know that you get what you pay for. Discounting Works For Consumer Brands, or Does It? Businesses that sell products to consumers often consider themselves a commodity. If they are selling the same product as someone else, then the consumer must focus on price, right? Not necessarily, as I have often shared, Nordstrom and Zappos have created value that goes well beyond price. Their customer experience provides their differentiation, not their price. When other stores collapsed, these retailers stayed strong. Over the past five years, Nordstrom’s value has grown 400% and Zappos has grown roughly 500%. Over the same period, discounters like JC Penny have dropped. If you look at their stock charts, one seems like an opposite reflection of the other. 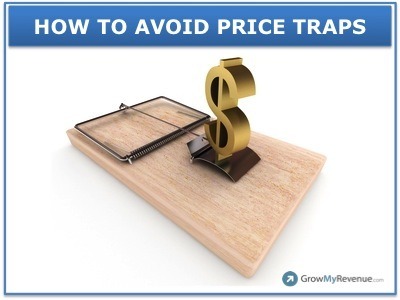 How To Avoid Price Traps? If you struggle to define your differentiation, then how will your client ever figure it out? Your differentiation might be the markets you serve, the problems you solve, or the experience you bring to the table. If you and your team don’t believe in your differentiation, nobody else will. In working with a client recently, the major difference between their top performer and their bottom performer came down to their belief in what the company offered. The top performer confidently sold for full retail, and the bottom performer felt nobody would buy even after a steep discount. It is never about price, unless the person doing the selling doubts their value. When your prospect says “You are more expensive than the other vendor.” How do you react? You could simply drop your price and hope that does the trick. Or, you might ask a question like “We are never the least expensive. I appreciate that you probably need to see a few things that demonstrate a return on investment to be comfortable paying a bit more for us. What are the most important areas I can show you? You might be surprised when your prospect explains how easy it is to make them comfortable spending a bit more for your product or service. When did maintaining your price help you make a sale? Can you think of a situation where the seller dropped the price and you decided NOT to buy because of that?